One of the items discussed at the July, 2016 Membership Meeting was the possibility of upgrading the trophies and possibly moving the site for the 2016 Annual Awards Banquet. It has been held at Cattlemen's Steak House for a number of years. This spurred me into researching and presenting a brief history of the Awards Banquets. The cutoff date was set at 1999 for two reasons; That's a natural breaking point, and Region records since 1999 are incomplete or non-existent due to there not being a Gasket Gazette published during most of the latest years. 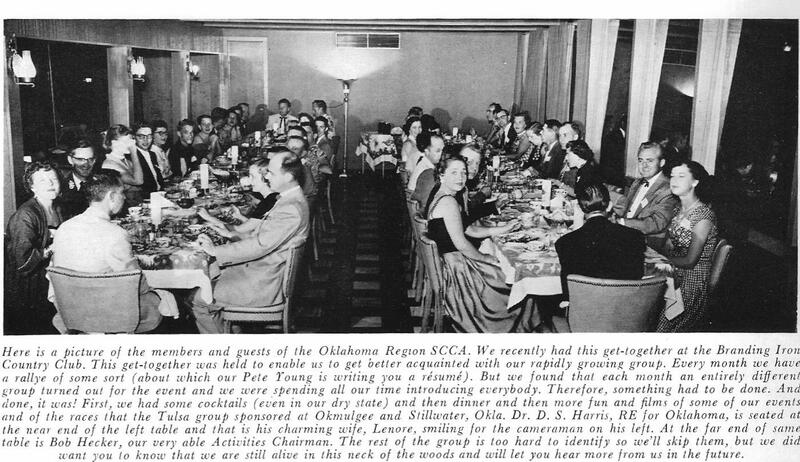 Oklahoma Region has always been a party bunch, as attested by this 1953 photo and caption from Sports Car Magazine. Fenced in and lighted parking lot behind old Sears Bldg. On Harvey (not free). Twin Hills Country Club was the site for the 1960 Awards Banquet. The Leslie family, C.A. and Mary Kay, were the big winners that year. They are shown below with some of the hardware they took home that night. The large silver bowl is the “Outstanding Member” award C.A. won, and the smaller silver bowl is Mary Kay's Navigators Trophy. 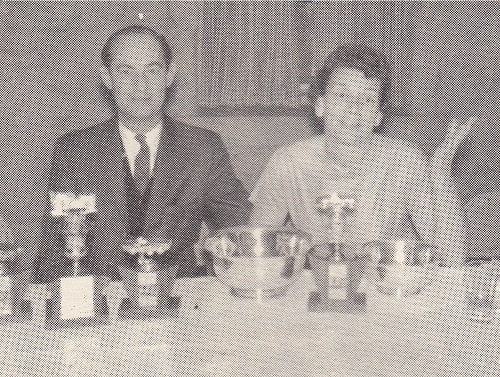 SOLO Class Awards were first presented in 1966 as Gymkhana Class Champions. George England's recounting of that year's banquet can be read here. The “Smiling Indian” Award was introduced at the 1979 Awards Banquet held at South Gate Inn. This custom cast medallion was awarded to Wiley Hunt for becoming the Region's first 25 Year SCCA member. Wiley joined the Region in its infancy, 1954. Also taking home a medallion was Betty Wills because she won a SOLO II National Championship. Several of these medallions were recently found in club materials that had been stored since 1979 and regional Executive Mark Council may find an appropriate use for them. A total budget of $1,350.00 was approved by the Region Board for 1980. Twenty dollars per trophy was allotted, and the cost for attending was $8.00 for members and $12.00 for non-members. At the Executive Board Meeting on Thursday, October 28, 1982, the sometimes circuitous planning for an Awards Banquet was detailed in the Meeting minutes as follows. made a motion to select Saturday, December 18 at Holiday Inn Northwest, seconded by Karen Flippo- motion passed. Frank Smith made a motion to keep fee same as last year $10.00 (Member) & $15.00 (Non-Member), seconded by Beth Ingram - motion defeated 4 to 5. Leon Mackechnie made a motion to charge $10.00 (member) & $15.00 (non-member) if paid by December 10 then going to $15.00 & $20.00, seconded by Frank Smith - motion defeated 4 to 5. Pat McKay made a motion to charge $12.00 (member) & $18.00 (non-member) asking for advance payment but not demanding (preferably 8 days), seconded by Glen Snapp - motion passed with two dissenting votes. Leon Mackechnie made a motion to award all Gazette Advertisers 2 free tickets & Invitation to Awards Banquet, seconded, - Motion passed. Jerry Crew made a motion to pay for Editors of Gazette, seconded by Leon Mackechnie - motion defeated. Doc Foerster, Sandra Saucier, Margaret England, Elouise Norris, Ron Reid. Arterburn, John Saucier, Gene Rolfe, Lonnie Morse, Paul Grounds.